Dr. Saunders has been the Program Coordinator for the Adult Gerontology Clinical Nurse Specialist (AGCNS) program since 2010. 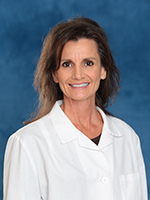 She has over 20 years of experience as a certified Adult Clinical Nurse Specialist. Dr. Saunders is committed to growing the numbers of AGCNSs nationwide and showcasing the impact of the CNS role. She actively speaks on practice issues affecting nursing and remains involved in legislative processes at the state and national level. She is an active member of the National Association of Clinical Nurse Specialists. Besides teaching in the AGCNS program, Dr. Saunders teaches an interprofessional course in health policy. Her research interests are family caregiving, CNS role and methods in on-line learning. Dr. Saunders is certified by the Association of College and University Educators in effective teaching practices in higher education.